Italy-based Sofidel’s recently completed acquisition of Cellynne Corp., Haines City, Fla., USA, marks the first European tissue investment in North America since SCA’s acquisition of Georgia-Pacific’s away-from-home business in 2001. Sofidel’s investment also comes during a period when North American producers have exited Europe. This issue of From the Experts takes a closer look at the strategic rationale behind the acquisition and how this change of ownership impacts the market in North America. With 960,000 metric tpy of tissue manufacturing capacity, Sofidel is the second largest producer in Europe. The company has a wide product offering, providing both branded and private label products to the at-home and away-from-home markets, and also supplying parent rolls. The acquisition of Cellynne positions Sofidel in North America as the twelfth largest producer with less than 1% of capacity. 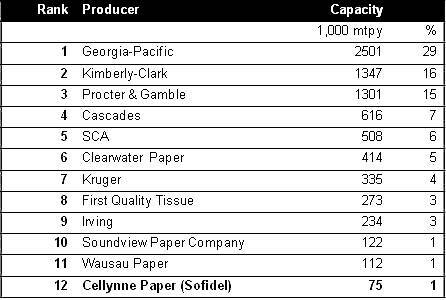 Cellynne as a stand-alone company appears to be strategically aligned with Sofidel’s tissue business. Cellynne mainly supplies the away-from-home markets with its Heavenly Soft, Confidence, and Heavenly Choice brands, but has also expanded its product offering into at-home markets and private labels. The tissue mill is also similar to Sofidel’s mills in Europe, especially as it is non-integrated to pulp. Of Sofidel’s 19 mills, only two have integrated deinked pulp (DIP) systems and the other 17 mills are non-integrated operations. The most significant driver of the acquisition, however, is the entrance to the North American market. The presence of European producers in North America has been limited. The growth in private labels, a trend that has been dominant in European markets, may make the North American market more attractive for European producers. The historical dominance of high quality brands may have made North America a more difficult market to enter. The North American market is undergoing significant change. Growth in private labels is outpacing branded products, significant capacity closures have taken place on the West Coast, and the next wave of capacity investments in well underway. Sofidel’s entrance into North America marks the first European investment since SCA in 2001. As these changes occur, it will be interesting to see if North America attracts more investment from foreign producers.